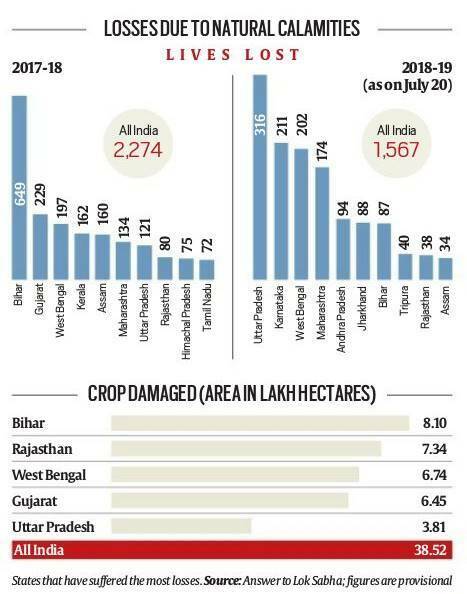 Telling Numbers — During the period April 1 to July 20, as many as 1,567 people — about 14 a day — died due to natural calamities such as storms, floods, and landslides across the country, Lok Sabha was told in response to a question Tuesday. During the period April 1 to July 20, as many as 1,567 people — about 14 a day — died due to natural calamities such as storms, floods, and landslides across the country, Lok Sabha was told in response to a question Tuesday. The most deaths occurred in Uttar Pradesh (316), followed by Karnataka (211) and West Bengal (202). A series of duststorms and thunderstorms, accompanied by lightning, rolled across northern and eastern India in May and June, triggering heavy losses of life and property. The losses have been much heavier in the current financial year so far compared to 2017-18, when a total 2,274 lives (or six a day) were lost across the country over the full year. Congress has given notices for breach of privilege against PM Narendra Modi and Defence Minister Nirmala Sitharaman in Lok Sabha for “misleading” the House on the Rafale deal. What does that mean? Privilege, purpose, limits: Parliament’s Houses, Committees and Members enjoy certain rights and immunities without which they cannot perform their functions effectively. These are called privileges. Parliamentary privileges are intended to protect the freedom, authority and dignity of Parliament. But these privileges do not exempt MPs from their obligations as citizens. Committee on Privileges: A 15-Member Committee nominated by the Speaker examines every issue involving a breach of privilege of the House upon reference by the Speaker, and makes requisite recommendations. The head of the Committee is currently Meenakshi Lekhi of the BJP. Procedure: A Member may, with the consent of the Speaker, raise a question involving a breach of privilege either of a Member or of the House. The Member is required to give notice in writing to the Lok Sabha Secretary-General by 10 am on the day the question is proposed to be raised. If the question is based on a document, the notice must be accompanied by it. A notice received after 10 am is deemed to have been received at 10 am the next day. Only one question is allowed to be raised per sitting. It has to be restricted to a specific matter of recent occurrence and warrant an intervention by the House. If the Speaker holds that the matter proposed to be discussed is in order, she shall call the Member concerned, who, while asking for leave to raise the question of privilege, make a short statement. If an objection to leave being granted is taken, the Speaker shall ask the Members in favour of leave being granted to rise, and if not less than 25 members rise, the Speaker shall declare that leave is granted. When a question of privilege is referred to the Committee, the report is presented to the House by the Committee chair. Punishment: The House can let off an offender after a warning, or even send him to prison. 2 What lies behind India’s Africa outreach?